History is filled with stories of rebellion—and not just history, as Sarah Jaffe shows. What we’ve too often lacked are reporters willing and able to weave one-day stories into meaningful fabric. Jaffe does just that, with depth and breadth and eloquence. Necessary Trouble is necessary reading, and Jaffe’s arrival is something to celebrate. 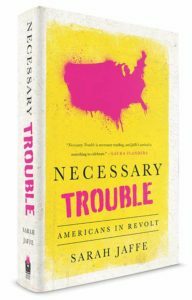 Necessary Trouble is American history at its freshest and most compelling. Sarah Jaffe traces the many ways—from left to right—that Americans have risen up in response to the country’s ongoing takeover by the obscenely rich. Sometimes we have to make trouble, and, as Jaffe reports, we’re pretty damn good at it!